The rapid evolution of today’s communication mediums has brought about a radical change in how public opinions are framed and public discourse is conducted. In general, the conventional boundary between public and personal communication has somewhat disappeared. Incredible global platforms, like Google allow us all gain access to information in a blink of an eye. In order to do so, they use computer algorithms that weigh “relevance”, but sometimes the standards do not correspond to the expectation of the users. Algorithms function distinctly and descriptively. For an instance, the technology alters “relevance” for a user based on what links he or she has clicked in the past. But still, many users think the results are normative (‘higher’ up in Google results). In several cases, Google’s algorithms determine a massive divergence between content quality and “relevance”. Not only that, owing to their encompassing database, Google and Facebook play a strong role in forming public opinions. 57% of German internet users get access to information about social affairs and politics through Google and other social networks. The researchers from Hamburg-based Hans Bredow Institute quoted in 2016, “the formation of public opinion is no longer conceivable without intermediaries, such as Google and Facebook”. The design elements that Google and other intermediaries use are leading to a structural change in public discourse. Today, publishing is a piece of cake. Anyone can publish anything on the web, but everyone might not find an audience – for the latter, decision-making algorithms are needed. They garner the needed attention. They also determine the relevance of each content piece that goes through various social networks, like Facebook and filter the items that should be displayed for each user. In making an individual’s feed attractive, Facebook runs a detailed analysis and determines which content the user and his or her friends’ likes or prefers to hide. Both signals are important to perform a fairly straightforward analysis. Moreover, Facebook deploys signals that users have no idea about, such as the amount of time they take to look into a single entry in the feed. In other areas too, algorithmic decision-making plays a crucial role, like offering help in legal matters or assessing where and when the police officers are on duty. 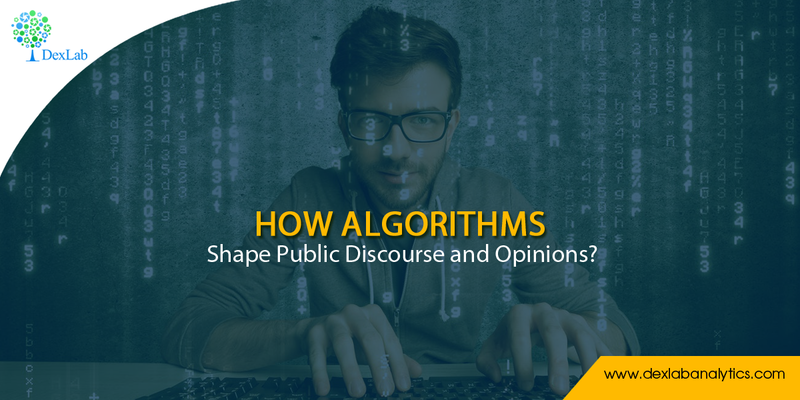 To guarantee a diversity of media in the public, make sure the algorithmic decision-making processes that determine relevance are diverse in the same manner. The digital discourse is supported by the robust algorithms that constantly ranks and personalize content. Coupled with strong industry self-regulation and legislative measures, a true and impartial notion of social and political influences on algorithmic ranking is established, which carries the potential to discover and combat dangers early on. Are you still craving for more information on algorithms? Yes? Then satiate your data hunger with Machine Learning Using Python courses from DexLab Analytics. Arm yourself with a Machine Learning course online, and hit the notes of success through life!